Recreational cannabis sales officially begin in California today, but fewer than 100 adult-use retail licenses have been issued throughout the state – which may lead to long lines and supply issues for the rec stores able to open their doors on New Year’s Day. California’s Bureau of Cannabis Control – the agency overseeing the licensing process for retailers, distributors, microbusinesses and testing labs in the state – began issuing temporary licenses to adult-use companies in mid-December. Eighty-eight temporary rec store licenses had been issued as of Dec. 31. Temporary licenses are issued only to applicants with a valid license, permit or authorization from their local jurisdictions. So businesses located in a municipality that has either banned adult-use cannabis or has not finalized rules to govern and license local marijuana companies are ineligible to receive a temporary license from the state. Temporary licenses are good for 120 days, after which a permanent license must be obtained. Even though a retailer has been granted a temporary adult-use license, it doesn’t necessarily mean the store will be open New Year’s Day – that’s up to the business owner(s) to decide. San Diego, San Jose and Sacramento are the largest cities in the state where rec stores are expected to be open on New Year’s Day. Los Angeles and San Francisco are expected to begin rec sales sometime in early January. 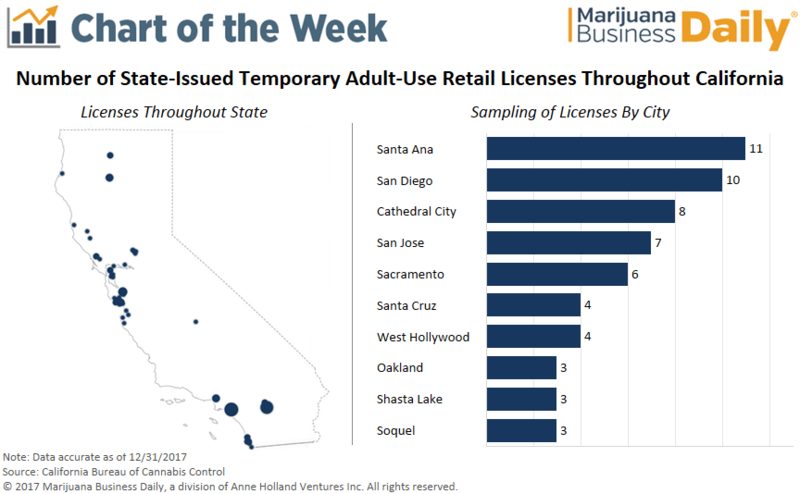 Temporary adult-use retail licenses have currently been granted in 34 cities, representing 12% of California’s total population. Where can I go to find a list of business that have been issued temporary licenses?